Difference between revisions of "Eclipse Modeling Framework Technologies"
The Eclipse Modeling Framework Technologies ([http://www.eclipse.org/modeling/emft/ EMFT]) project was initiated to incubate new technologies that extend or complement [http://www.eclipse.org/modeling/emf/ EMF]. Over time, projects will graduate from EMFT into other Modeling projects, such as [[Eclipse_Modeling_Framework|EMF]], [[MDT]] or [[M2T]]. * [[Edapt]]: [http://www.eclipse.org/projects/project_summary.php?projectid=modeling.emft.edapt EMFT Edapt Project page], [http://www.eclipse.org/proposals/edapt/ EMFT Edapt Proposal], Moritz Eysholdt, Markus Herrmannsdoerfer. * See [http://www.eclipse.org/modeling/emft/eclipse-project-ip-log.php Project IP Log]. 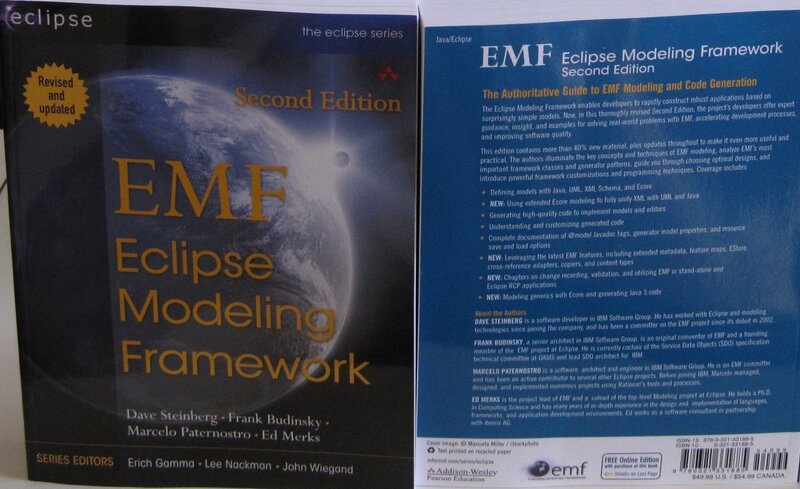 To learn more about the technology on which the EMFT projects are built the most authoritative source is the book, [http://www.informit.com/store/product.aspx?isbn=9780321331885 EMF: Eclipse Modeling Framework, 2nd Edition]. Have a question? Try the FAQ for your individual component. If that doesn't help, chances are [http://www.eclipse.org/modeling/emft/newsgroup-mailing-list.php your question has been answered in the newsgroup]. See also [[:Category:EMFT]] or [[:Category:Releng]]. * [http://eclipsezilla.eclipsecon.org/show_bug.cgi?id=3619 EclipseCon 2007 submission "Effective Use of the Eclipse Modeling Framework"] by Ed Merks et al. * [http://www.eclipsecon.org/2007/index.php?page=sub/&id=3619&conference=2007 Effective Use of the Eclipse Modeling Framework], EclipseCon 2007, by Ed Merks et al. The Eclipse Modeling Framework Technologies (EMFT) project was initiated to incubate new technologies that extend or complement EMF. Over time, projects will graduate from EMFT into other Modeling projects, such as EMF, MDT or M2T. Edapt: EMFT Edapt Project page, EMFT Edapt Proposal, Moritz Eysholdt, Markus Herrmannsdoerfer. Component owners: please provide a quick wiki page at the above links, culled from the materials linked above. To learn more about the technology on which the EMFT projects are built the most authoritative source is the book, EMF: Eclipse Modeling Framework, 2nd Edition. See also Category:EMFT or Category:Releng. Effective Use of the Eclipse Modeling Framework, EclipseCon 2007, by Ed Merks et al. This page was last modified 22:56, 28 December 2010 by Hendy Irawan. Based on work by Steffen Stundzig, Hajo Eichler and Goulwen Le Fur and others.